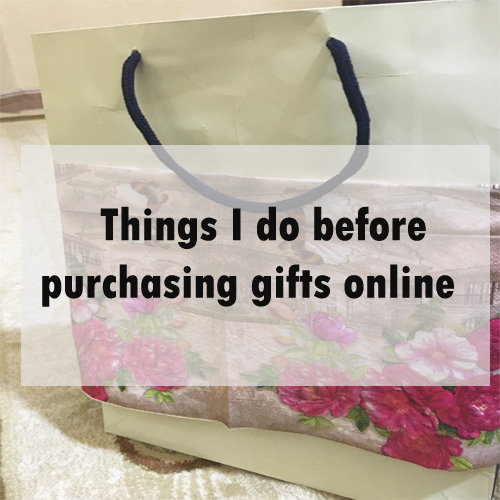 I have been thinking of sharing some of the things that I do when shopping online for a gift that you want to give to anyone you love. I have come to a conclusion that I should do it and this is what this post is going to be about. Shopping online is something that I use to do most of the time and it doesn't seem to be more expensive than any local store. I have been enjoying it since my first purchase when I shopped for myself back in like years ago and I'm still going to do it forever I guess. The difference between local shopping and online shopping is that you can hold the item and check it before getting and I will mention something below that could help you to make your decision on whether you get it or not. Also. When you shop it online it should be shipped to you which take time to arrive, but I don't think it would be a problem to consider. This is not my first time shopping online, but what I'm going to mention is good for people who have already shopped and also for people who haven't shopped before because I think it works the best for me every time I do it. I'm sure it will work for you too unless you have another way of doing it which you can share with us in the comment section below if you want. What I like about the online shopping is that I can compare the same product on many websites and see different experiences from people. But to be honest, I only look for big companies such amazon or eBay though I haven't purchased anything from eBay because I can trust them and the delivery will be much better than the small companies and websites. Anyways, let's get this post started and hopefully you guys find this post somehow helpful for you when you try it for the first time or already done before. If you have another way as I said I would love to know about it and would be awesome if you could share it with us in the comment section. This method works for the quality of the product or the design as well because you need a quality that impresses people and make people like it otherwise it will not make it and whoever get is it will be a little bit disappointed if it will break after a week or even a month. I always look for long good quality when I purchase anything. Some people purchase stuff based on the price thinking that the higher the price the better quality and I wouldn't disagree with this actually, but you can find good quality and bad quality of the products that have lower prices and higher prices as well. Reading the information for the product after you decide which design you will pick is necessary for both local and online shopping but you will find all the information about the product when doing local shopping but when going for the online shopping you will only read what mentioned by the company or seller which basically give you the headlines of the product or the necessary information. You have to decide what you need so it will be easy to find the right information or details. I always check the information and see if it match what I want or what's in my mind. For example, if I would buy a watch for my friend and I want it to be a leather so I would look for a watch that has leather and so on. If you don't have any specific style or details about the product but you kinda want a good quality and a good product. Well, I would say the next step that I'm going to mention is going to help you to find out the right for you. One of the best things about online shopping is that it gives you the ability to share your experience with the product and help others to kinda have a perspective on the product before buying which really helped me a lot to purchase good and awesome gifts for my friends and family. You can learn more about the product with real experience and real people from the reviews. However, there are some items that don't have reviews because whether people haven't bought it yet, or it didn't receive any review after buying it and in this case, I would tend to go with similar items if the one I picked doesn't have enough amount of reviews if it's meant to be a gift because I don't want to mess it up when it's gift but I could spend money on items that don't have reviews if its not gift and I could return if there is something bad but when it comes to gift, I think it will be ruined if comes with bad quality. I'm not saying that the one with reviews are trusted and will be perfect because sometimes you will buy a product with so many people who have done a good feedback on it and then when you buy it you find out that it wasn't as the reviews, but I would say that it has a high chance of being trustworthy. You can take this as a way to know what you will be expecting when you buy the product which is really good. I always look for products or items that have high good and positive reviews and still hoping that it won't be bad. As I said in the previous step if you don't have any particular information about the item or product that you want to buy and you looking for a good one, the reviews will help you to decide on which one is good but still, you need be specific because everyone has its own style and you might not like it. I have been using this method for so long and every time it works perfectly and talking about this actually, I have recently done it and my friend seems to like it which really amazing. I would like to know if you use this same method or do you have another way of purchasing online and other than that have a good day.